In the previous article (https://guruparamparai.wordpress.com/2012/09/19/thiruvaimozhi-pillai/) we discussed about thiruvAimozhi piLLai. Now we will move on to the next AchAryan in the OrAN vazhi guru paramparai. Sishyas: ashta dhik gajangaL – ponnadikkAl jIyar, kOil aNNan, pathangi paravasthu pattarpirAn jIyar, thiruvEnkata jIyar, eRumbiappA, prathivAdhi bhayankaram aNNan, appiLLai, appiLLAr. nava rathnangaL – sEnai muthaliAndAn nAyanAr, satagOpa dhAsar (nAlUr siRRAththAn), kanthAdai pOrERRu nAyan, yEttUr singarAchAryar, kanthAdai aNNappan, kanthAdai thirukkOpurathu nAyanAr, kanthAdai nAraNappai, kanthAdai thOzhapparappai, kanthAdai azhaiththu vAzhviththa perumAL. He had many other sishyas from various thiruvamsams, thirumALigais and dhivya dhEsams. 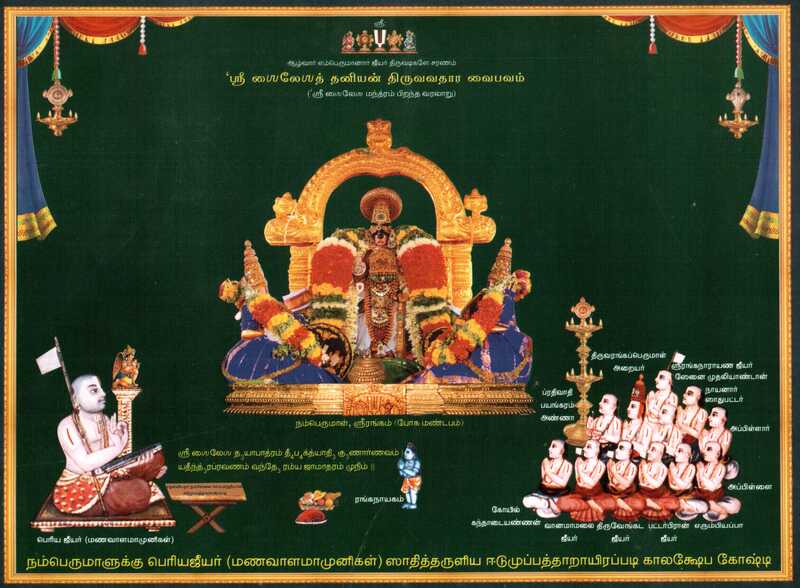 Works: prabhandhams: sri dhEvarAja mangaLam, yathirAja vimsathi, upadhEsa rathina mAlai, thiruvAimozhi nURRandhAthi, Arthi prabhandham. 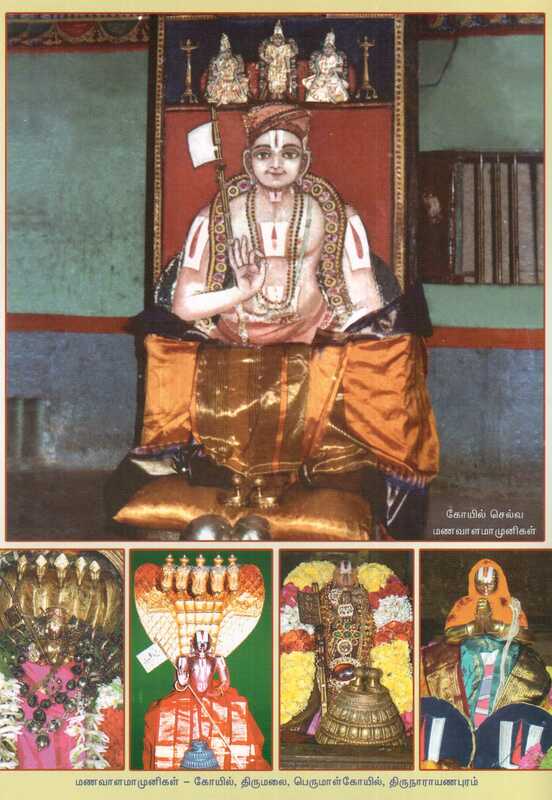 vyAkyAnams for: mumukshupadi, thathva thrayam, srivachana bhUshaNam, AchArya hrudhayam, periyAzhwAr thirumozhi (for the portion which was missing from periyavAchAn piLLai’s vyAkyAnam), rAmAnusa nURRandhAthi. pramANa thirattu (compilation of all slOkams, sAsthra vAkhyams in a particular gratham) for: eedu 36000 padi, jnAna sAram, pramEya sAram, thathva thrayam, srivachana bhUshaNam. azhagiya maNavALa mAmunigaL, sundhara jAmAthru muni, ramya jAmAthru muni, ramya jAmAthru yOgi, varavaramuni, yathIndhra pravaNar, kAnthopayanthA, rAmAnujan ponnadi, soumya jAmAthru yOgIndhrar, kOil selva maNavALa mAmunigaL, etc. He also has the titles periya jIyar, veLLai jIyar, visthavAk sikAmaNi, poi illAtha maNavALa mAmuni, etc. Born in AzhwAr thirunagari by the grace of periya perumAL as an avathAram of AdhisEshan. He learns all the sAmAnya sAsthram and does vEdha adhyayanam under his father’s guidance in his mother’s place sikkil kidAram. He also gets married in due course. Hearing about thiruvAimozhi piLLai’s vaibhavam, he returns to AzhwAr thirunagari and surrenders to him. We have already seen this in the previous article. His wife gives birth to a son and he requests thiruvAimozhi piLLai to give a suitable name. thiruvAimozhi piLLai says rAmAnujan is repeated 108 times (in rAmAnuja nURRanthAdhi), so that must be the best. Based on that he names his son “emmaiyan irAmAnusan”. After thiruvAimozhi piLLai attaining paramapadham, he becomes the dharisana pravarthakar. He becomes an expert in aruLicheyal especially thiuvAimozhi and eedu 36000 padi vyAkyAnam. He also starts collecting all the supporting pramANams for eedu vyAkyAnam and documents them. Hearing about his glories, azhagiya varadhar (from vAnamAmalai) becomes the first sishya of azhagiya maNavALa perumAL nAyanAr and immediately accepts sannyAsAshramam to render continuous service to his AchAryan. He gets to be named as vAnamAmalai jIyar (because of his native place) and ponnadikkAl jIyar (because he becomes the first sishya of nAyanAr and lays the foundation for many more to follow – pon adikkAl means golden foundation). Recollecting his AchAryan’s niyamanam to go and live in srirangam to propagate our sampradhAyam, he goes to AzhwAr and takes permission from him to travel to srirangam. On the way to srirangam, he performs mangaLAsAsanam to srivilliputhur ANdAL rangamannAr and thirumAlirunchOlai azhagar. He reaches srirangam, performs his nithyakarmAnushtAnam at the banks of cauvery river. All the srivaishnavas from srirangam comes out to welcome him and with the purushakAram of the local srivaishnavas he does mangaLAsAsanam to emperumAnAr, nammAzhwAr, periya pirAttiAr, sEnai mudhaliAr, periya perumAL and namperumAL with his nAchiArs in order. perumAL welcomes him as he welcomed emperumAnAr and gives him special prasAdhams and sri satagOpam. After that he visits piLLai lOkAchAryar’s thirumALigai and glorifies piLLai lOkAchAryar and his younger brother azhagiya maNavALa perumAL nAyanAr for their contributions for our sampradhAyam. He stays in srirangam for a while and one day namperumAL instructs him to do nithyavAsam (stay permanently) in srirangam teaching all the in-depth meanings of our sampradhAyam. He accepts that order happily and thereafter starts collecting all the granthams which were lost during the muslim invasion. Once, when ponnadikkAl jIyar complains to him about uththama nambi about his services, he instructs jIyar to reform him and engage in emperumAn’s service properly. Then he desires to visit thiruvEnkatam and starts his journey along with ponnadikkAl jIyar. On the way, he performs mangaLAsAsanam at thirukkOvalUr and thirkkadigai. In thirumalai, periya kELvi appan jIyar (who was established by emperumAnAr) sees a svapnam where he says a srivaishnava (gruhasthar) who looks like periya perumAL lying down and a sannyAsi standing at the lotus feet of the srivaishnava. In the svapnam he asks the people who are passing by about them and they say they are “thiruvAimozhi eettu perukkar azhagiya maNavALa perumAL nAyanAr and his prAna sukruth (life breath/well wisher) and sishyar ponnadikkAl jIyar”. Waking up he is thinking about the auspicious svapnam and finds out that they both are arriving to thirumalai shortly. nAyanAr arrives at thirupathi, worships the thiruvEnkata malai, gOvindharAjar, narasimhar (at the bottom of the hill) and finally reaches thirumalai. periya kElvi appan jIyar arranges for a grand welcome to nAyanAr and ponnadikkAl jIyar and brings them to thiruvEnkatamudaiyAn for mangaLAsAsanam. thiruvEnkatamudaiyAn being very pleased to see them, gives them his prasAdhams and sri satagOpam and finally they take leave from him. He arrives at kAnchipuram and performs mangaLAsAsanam to dhEva perumAL.and dhEva perumAL proclaims him to be the same as emperumAnAr himself and gives his prasAdhams and sri satagOpam. He then reaches sriperumpUdhUr and completely immerses into emperumAnAr’s anubhavam and performs mangaLAsAsanam. He returns back to kAnchipuram and starts hearing sri bhAshyam from kidAmbi nAyanAr (who is a descendant of kidAmbi AchAn). When srivaishnavas come to do tharkam with him on certain matters, he first refuses citing his AchAryan’s orders on only indulging in bhagavath vishayam but later when convinced by his well wishers, he takes up the task and gives fitting explanations to the ones who came for debate and they finally fall at his lotus feet and praise him very much. kidAmbi nAyanAr being amazed by azhagiya maNavALa perumAL nAyanAr’s intelligence requests him to show his real svarUpam. Since kidAmbi nAyanAr was in his AchArya sthAnam teaching sri bhAshyam, azhagiya maNavALa perumAL nAyanAr obliges and shows him his AdhisEsha svarUpam. kidAmbi nAyanAr becomes very much ecstatic and then onwards shows great attachment towards him. Finally after completing the sribhAshyam kAlakshEpam he takes leave and returns to srirangam. Seeing his return periya perumAL becomes joyful and instructs him to stay in srirangam without taking up any more yAthrais. During that time, his relatives inform about some Asoucham which interrupts his kainkaryam. He accepts sannyAsAshramam from a satagOpa jIyar (who is a sishya of thiruvAimozhi piLLai and studied with him in AzhwAr thirunagari) and immediately goes to periya perumAL to inform about that. periya perumAL welcomes him and instructs him to keep the same thirunAmam (due to the divine reason of him wanting to maintain his future AchAryan’s name) and gives him pallava rAyan mutt for him to stay and conduct his kAlakshEpams, etc. 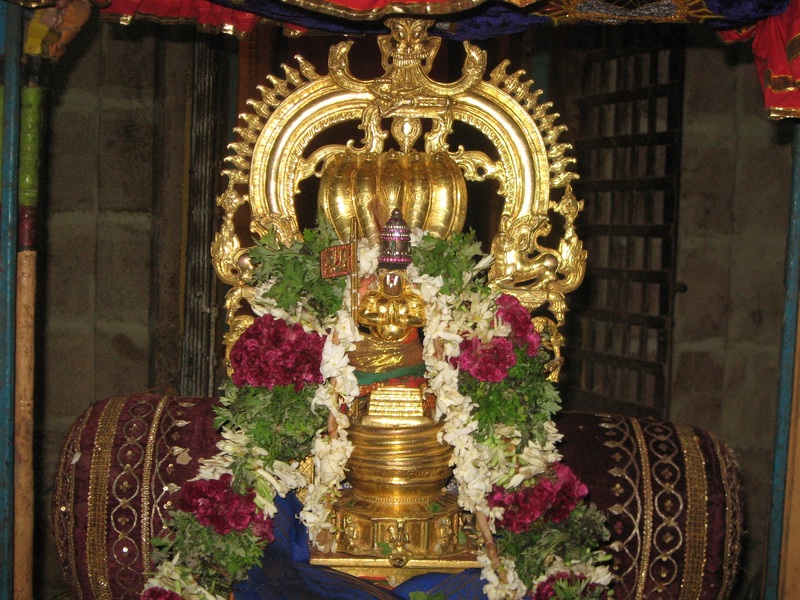 Thus azhagiya maNavALa perumAL nAyanAr becomes azhagiya maNavALa mAmunigaL. All the srivaishnavas under the leadership of uththama nambi went with him to his mutt and sang “manavALa mAmuniyE innumoru nURRAndirum” out of joy. He instructs his sishyas under the leadership of ponnadikkAl jIyar to repair the mutt fully. A beautiful mandapam is built with the sand from piLLai lOkAchAryar’s thirumALigai and is named thirumalai AzhwAr where he performs his kAlakshEpam regularly. He spends his day giving lectures on thiruvAimozhi (eedu) and other prabhandhams, emperumAnAr’s glories and srivachana bhUshaNa dhivya sAsthram, etc to all his disciples and abhimAnis. His glories spread everywhere like wild fire and many srivaishnavas come and take shelter of mAmunigaL. thirmanjanam appA (who is a nithya kainkaryaparar to periya perumAL), her daughter (AychiyAr) and pattarpirAn jIyar become his sishyas. One swamy from vaLLuva rAjEndhram (a nearby village) named singaraiyar supplies some vegetables to mAmunigaL’s mutt and emperumAn being pleased with his action show in his svapnam that “mAmunigaL is none other than AdhisEshan himself and he should go and take shelter of mAmunigaL”. So he travels to srirangam and stays at (kOil) kandhAdai aNNan thirumALigai and shares this incident with aNNan. aNNan thinking about this and lies down to sleep and he sees emperumAnAr and mudhaliANdAn in his dream where emperumAnAr says mAmunigaL is none other than himself. In the dream, mudhaliANdAn instructs kOil aNNan (and uththama nambi) to surrender to mAmunigaL. After waking up, kOil aNNan along with his brothers goes to mAmunigaL’s mutt, takes the purushakAram (recommendation) of ponnadikkAl jIyar and submits himself to mAmunigaL. mAmunigaL gladly accepts him and performs panchasamskAram to him. Then AychiyAr’s (thirumanjanam appA’s daughter) son appAchiAraNNa wants to take shelter of mAmunigaL. mAmunigaL was very happy to hear that but he invites ponnadikkAl jIyar who he considers as his life breath and well wisher, offers his own simhAsanam, presents his own thiruvAzhi and thiruchakkaram and asks him to do panchasamskAram. While ponnadikkAl jIyar first refuses, he has no other choice than accepting his AchAryan’s thiruvuLLam and performs pancha samskAram for appAchiAraNNA. emmaiyan irAmAnusan (pUrvAshramam son of mAmunigaL) lives in AzhwAr thirunagari, gets married and gives birth to two sons – azhagiya maNavALa perumAL nAyanAr (who becomes to be known as jIyar nAyanAr for his attachment and kainkaryam to mAmunigaL subsequently) and periyAzhwAr aiyan. mAmunigaL decides to do mangaLAsAsanam to nammAzhwAr and takes permission from periya perumAL to go there. He reaches AzhwAr thirunagari, performs his nithya karmAnushtAnams on the banks of the holy thAmirabharaNi river, and does mangaLAsAsanam to bhavishyadhAchAryan (emperumAnAr), thiruvAimozhi piLLai and his thiruvArAdhana perumAL inavAyar thalaivan, nammAzhwAr and polindhu ninRa pirAn. When he has a doubt for one of the chUrNikais in AchArya hrudhayam, he thinks about thirunArAyaNapurathu Ayi who was a sa-brahmachAri (class-mate) of his AchAryan thiruvAimozhi piLLai. He starts his journey to meet him, but right outside AzhwAr thirunagari, he meets Ayi who has travelled all the way from thirunArAyaNapuram to meet mAmunigaL. Both embrace each other with joy and glorify each other. While mAmunigaL writes a thanian glorifying Ayi, Ayi in turn writes a pAsuram which asks if mAmunigaL is emperumAnAr himself or nammAzhwAr or emperumAn himself. After some time Ayi returns to thirunArAyaNapuram and mAmunigaL continues his stay in AzhwAr thirunagari. Some people who were jealous of mAmunigaL’s glories, sets fire to his mutt. But mAmunigaL takes his snake form and comes out of the mutt and takes his form back and stands in the middle of the srivaishnavas looking from outside. When the king decides to punish the miscreants mAmunigaL asks him to forgive them and looking at his kAruNyam they also take shelter of him. The king of the region, looking at mAmunigaL’s glories, accepts pancha samskAram from him and performs many kainkaryams in AzhwAr thirunagari and thirukkurungudi dhivya dhEsams. mAmunigaL returns to srirangam and continues his kainkaryams there. At that time eRumbiappA from eRumbi village hears about mAmunigaL and visits him. After the visit, he leaves without taking the prasAdham of mAmunigaL. After reaching his village, when he tries to open his emperumAn chakkaravarthi thirumagan’s sannidhi door, it does not open. emperumAn tells him that he committed apachAram at the lotus feet of mAmunigaL who is none other AdhisEshan and instructs him to take shelter of mAmunigaL, perform kainkaryam to him and accept his prasAdham – only then the door will be opened. eRumbiappA returns to srirangam and submits himself to mAmunigaL. He writes a wonderful prabhandham named dhinacharyA which has two parts – pUrva dhinacharyA (morning activities of mAmunigaL) and uththara dhinacharyA (evening activities of mAmunigaL). jIyar appreciates kandhAdai nAyan who shows masterful brilliance even at a very young age. appiLLai and appiLLAr takes shelter of mAmunigaL through the purushakAram of ponnadikkAl jIyar. eRumbiappA takes leave from mAmunigaL and returns to his village to propagate mAmunigaL’s glories in his region. Once, uththama nambi who is one of the prominent srivaishnavas was doing thiruvAlavattam kaikaryam to periya perumAL privately. At that time mAmunigaL enters there to do his mangaLAsAsanam. uththama nambi asks him to leave quickly and mAmunigaL accepts his words and left quickly. When nambi becomes tired and lies down for a while near periya perumAL in his svapnam, periya perumAL points his fingers to AdhisEshan and tells nambi that mAmunigaL is none other than AdhisEshan himself. Waking up, he realises his apachAram and runs to mAmunigaL’s mutt and takes aparAdha kshAmanam and serves him with love after that. A srivaishnavi named satagOpa koRRi learns aruLicheyal from AychiAr. In the noon time, when mAmunigaL was resting privately, this ammaiyAr peeks through the key hole and finds mAmunigaL in his svarUpam (AdhisEshan form). Hearing the noise mAmunigaL comes out and enquires what she observed. ammaiyAr explains what she saw and mAmunigaL with a smile asks her to keep that a secret. mAmunigaL then decides to write commentaries to rahasya granthams. He first writes expert commentaries to mumukshupadi, thathva thrayam and srivachana bhUshaNam with many references from vEdham, vEdhAntham, ithihAsam, purANams, aruLicheyal, etc. Then he writes commentaries to rAmAnuja nURRanthAdhi, jnAna sAram and pramEya sAram which gives the charama upAya nishtai – i.e., understanding AchAryan is everything. When the srivaishnavas request him to write something crisp and clear for thiruvAimozhi, he writes thiruvAimozhi nURRanthAdhi. This is an unparallel grantham which is written in venpA (a type of poem that is easy to memorize but difficult to write), with one pAsuram for each padhigam in thiruvAimozhi where the starting/ending words of the pAsuram matches that of the padhigam, giving the meanings of the whole padhigam in just 2 lines and glorifying nammAzhwAr in the remaining 2 lines. When the srivaishnavas ask him to record the valuable teachings of our pUrvAchAryas, he writes upadhEsa rathina mAlai which gives an account of the birth stars of AzhwArs, their birth places and glories, emperumAnAr’s apAra kAruNyam, thiruvAimozhi vyAkyAnams and eedu avathAram/propagation details, avathAram of piLLai loKAchAryar and his magnum opus srivachana bhUshaNam, establishes that the essence of thiruvAimozhi is srivachana bhUshaNam and finally explaining the meanings of the same in detail. When some mAyAvAdhis come for a debate, he refuses to debate with them sticking to his “no debate” principle, but asks his sishya vEdalappai to debate with them. vEdalappai does so and easily defeats them. But vEdalappai decides to leave his native place shortly. At this time prathivadhi bhayankaram aNNA who is an expert scholar from kAnchipuram along with his wife, is serving in thirumalai because of his attachment towards thiruvEnkatamudaiyan by doing thirumanjana thIrtha kainkaryam. Once a srivaishnava from srirangam arrives in thirumalai and meets aNNA during his kainkaryam and explains the glories of mAmunigaL. Hearing about mAmunigaL, aNNA becomes very pleased and his desire grows very much to meet him. But in the process, he forgets to add thIrtha parimaLam (cardomom/yElakkAi, etc) and offers the thIrtham to the archakar. He later remembers that and runs to the archakar with the thIrtha parimaLam but archakar says the thIrtham was smelling more pleasant than ever before. aNNA understands the glories of just hearing about mAmunigaL making the thIrtham smell great and travels to srirangam. When he arrives at mAmunigaL’s mutt, mAmunigaL was explaining “onRum dhEvum” (thiruvAimozhi 4.10) padhigam which establishes emperumAn’s parathvam. mAmunigaL was fluently referring to all sAsthrArthams and explaining the pAsurams and aNNA becomes amazed by mAmunigaL’s knowledge and presentation. mAmunigaL stops at the 3rd pAsuram and says aNNA can hear only when he has sambandham with AzhwAr (through the OrAN vazhi AchArya paramparai). aNNA then goes to perform mangaLAsAsanam to periya perumAL. periya perumAL through his archakar instructs aNNA to surrender to mAmunigaL to get vilakshaNa sambandham. aNNA through the purushakAram of ponnadikkAl jIyar takes shelter of mAmunigaL and stays there for some time. Again mAmunigaL goes on a yAthrai to thirumalai. On the way, he performs mangaLAsAsanam to kachi pEraruLALan and stays in kAnchipuram for some time to reform many srivaishnavas there. He instructs appAchiAraNNA to stay in kAnchipuram as his representative. He then proceeds to thirumalai via thirukadigai, eRumbi, thirupputkuzhi, etc and reaches thirumalai. After performing mangaLAsAsanam there, he appoints a siriya kELvi appan jIyar to help periya kELvi appan jIyar (who was appointed by emperumAnAr himself) in his kainkaryams. On his way back he performs mangaLAsAsanam to thiru evvuL veerarAghavan, thiruvallikkENi vEnkata krishnan and many other dhivyadhEsams. He arrives at madhurAnthagam and worships the place where periya nambi performed pancha samskAram to rAmAnujar. He then reaches thiruvAli thirunagari and enjoys thirumangai AzhwArs and submits of vadivazhagu pAsuram and performs mangaLAsAsanam to all the emperumAns in the region. He then reaches thirukkaNNapuram, enjoys the sarvAnga sundhara (sourirAja) emperumAn and establishes a thirumEni for thirumangai AzhwAr there. After visiting many other dhivya dhEsams he finally returns to srirangam and stays there. He then instructs appAchiAraNNA to go to kAnchipuram as instructed before. At that time aNNA is very sad that he has to leave this wonderful gOshti and looking at that he orders two small thirumEnis of himself to be made out of his sombu rAmAnujam that was worshipped by ponndikkAl jIyar. He gives one of them to ponndikkAl jIyar and another one to aNNA (these thirumEnis of mAmunigaL can still be seen in vAnamAmalai mutt, vAnamAmalai and mudhaliAndAn thirumALigai in singa perumAL kOil respectively). He also gives “ennai thImanam keduthAi” emperumAn from his thiruvArAdhanam to aNNA (this emperumAn can still be seen in mudhaliAndAn thirumALigai in singa perumAL kOil). mAmunigaL crowns prathivAdhi bhayankaram aNNA as sribhAshya AchAryar, kandhAdai aNNan and sudhdha sathvam aNNan as bhagavath vishaya AchAryars. He also instructs kandhAdai nAyan to write an arumpadham for eedu 36000 padi. periya perumAL starts longing to hear bhagavath vishayam from mAmunigaL without any interruption and also starts thinking about accepting him as his AchAryan out of his own desire. Once during pavithrOthrasavam sARRumarai, when namperumAL goes to thiruppavithrOthsava mandapam and stays there mAmunigaL enters the mandapam to perform mangaLAsAsanam to him. At that time namperumAL orders to mAmunigaL in front of all the kainkaryaparars, AchArya purushas, jIyars, srivaishnavas, etc., to perform kAlakshEpam of nammAzhwAr’s thiruvAimozhi with eedu 36000 padi vyAkyAnam. He orders this to continue without any disruption/disturbance until the kAlakshEpam completes. mAmunigaL being very pleased and thinking with great humility that emperumAn has chosen him to do this, accepts emperumAn’s order. The next day when he arrives to the periya thirumandapam (outside periya perumAL sannidhi dvAra pAlakars), namperumAL with his nAchiArs, thiruvananthAzhwAn, periya thiruvadi, sEnai mudhaliAr, all AzhwArs and AchAryas is waiting for him to begin the kAlakshEpam series. mAmunigaL feeling blessed starts the kAlakshEpam of eedu 36000 padi vyAkyAnam with all the other vyAkyAnams (6000 padi, 9000 padi, 12000 padi and 24000 padi) and explains the deep meanings from sruthi perspective, sribhAshyam perspective, sruthprakAsikA perspective sri gIthA bhAshyam perspective, sri pAncharAthram perspective, sri rAmAyaNam perspective, sri vishNu purANam perspective, etc. He also explains word by word meanings, inner meanings, etc. This goes on for close to 10 months and finally they reach the date of sARRumurai on Ani thirumUlam. Once the sARRumurai is complete, namperumAL takes the form of a small child named aranganAyakam comes into the front of the gOshti even when others stop him. Keeping anjali mudhrai, he starts saying “srisailEsa dhayApAthram” and when asked to say more he says “dhIbhakthyAdhi guNArNavam” and when requested to say more again he says “yathIndhra pravaNam vandhE ramya jAmAtharam munim” and runs away. When the sishyas record the slOkam and bring the child back to the gOshti he is unable to read anything from the palm leaf and runs away again. Every one understands that it is none other than namperumAL himself offering the thanian to his AchAryan. At the same time, emperumAn sends this thanian to all the dhivya dhEsams – every where this spreads like wild fire. At that time, a vAzhi thirunAmam is also written by appiLLai by the orders of the srivaishnavas glorifying mAmunigaL. thiruvEnkatamudayAn, thirumAlirunchOlai azhagar also instructs that this thanian is recited at the beginning and end of any aruLicheyal anusandhAnam. Other dhivya dhEsams like bhadhrikAshram also gets emperumAn’s niyamanam to glorify mAmunigaL. mAmunigaL starts thinking about vada nAttu dhivya dhEsams and his sishyas take up vada dhEsa yAthrai on his behalf. mAmunigaL gives eRumbiappA his dhivya pAdhugas. mAmunigaL gives aranganagarappan (his thiruvArAdhana perumAL) to ponnadikkAl jIyar and instructs ponnadikkAl jIyar to go and establish a mutt in vAnamAmalai to do uninterrupted service to dheivanAyaka perumAL. mAmunigaL goes on a pAndiya nAttu dhivya dhEsa yAthrai once again. On his way, the king of that region (mahAbali vANa nAtha rAyan) becomes his sishya and performs many dhivya dhEsa kainkaryams based on his orders. When he is travelling near madhurai he stays under a tamarind tree to take rest and while leaving he touches the tree and gives mOksham to the tree. He goes on to perform mangaLAsAsanam in many dhivya dhEsams and finally returns back to thiruvarangam. Through his sishyas he performs various kainkaryams. He sends a jIyar swamy to go and serve thirumAlirunchOlai azhagar. He writes vyAkyAnam for periyAzhwAr thirumozhi for the part that was lost. periyavAchAn piLLai had already written a vyAkyAnam but part of that gets lost – so writes exactly up to the word where periyavAchAn piLLai’s vyAyAnam was not there. He becomes ill and still continues to write. When he was writing AchArya hrudhayam vyAkyAnam with great difficulty, many of his sishyas ask him why he was doing that. mAmunigaL replies that he is doing it for their sons and grandsons and generations to come. He develops great desire to give up his thirumEni and go to paramapadham. He writes Arthi prabhandham crying out to emperumAnAr to accept him and relieve him of this charama thirumEni. He is simply showing us how to do that, since he was emperumAnAr himself anyway. Finally he ends his dealings in the leela vibhUthi and decides to return to paramapadham to do eternal service to emperumAn. He desires to hear all the aruLicheyal once and all his sishyas arrange for that with great love and dedication. mAmunigaL becomes so pleased and performs a grand thadhiArAdhanam and asks for aparAdha kshAmaNam from everyone. Everyone replies that he was blemishless and no need to ask for any kshAmaNam. He then requests everyone to ensure that all the kainkaryams for periya perumAL and namperumAL were done with full love and full focus on them alone. He then says “piLLai thiruvadigaLE sharaNam”, “vAzhi ulagAsiriyan” and “emperumAnAr thiruvadigaLE sharaNam”. With wide open eyes he desires to see emperumAn and emperumAn immediately appears in front of him on garudan and carry him along – thus he ends his leelai in this vibhUthi in the most glorious way. Seeing this all the srivaishnavas starts crying so much. periya perumAL feels the void so much and refuses to accept any bhOgam. Finally all the srivaishnavas console themselves and each other and start the final kainkaryams. The thiruvadhyayana mahOthsavam was celebrated in the most grandeur way – even grander than periya perumAL’s brahmOthsavam based on periya perumAL’s orders. ponnadikkAl jIyar returns from his vada nAttu dhivya dhEsa yAthrai and also completes all the charama kainkaryams of mAmunigaL. Once two srivaishnavas are having some misunderstanding with each other. At that time when two dogs are fighting in the street in the presence of those two srivaishnavas – he looks at the dogs and asks the dogs “Have you also learnt srivachana bhUshaNam, etc like these two srivaishnavas to have so much ahankAram?”. Immediately they realize their mistake and become pure after that. When some one from vada dhEsam submits some wealth and when he understands that the wealth was not properly earned, he immediately sends that out. He shows no interest in material wealth, etc. Even when it comes to kainkaryam he ensures that he get money/material that are connected to srivaishnavas only. Once when an old lady comes to his mutt and requests him to stay there for the night. He insists to her that she cant stay in the mutt – he says “even an old squirrel can climb a tree” meaning even when an old lady stays in the mutt, some one may find a fault in mAmunigaL’s vairAgyam. So completely avoids anything which could cause doubt in anyone’s mind. Once when a srivaishnava ammaiyAr is helping in cutting vegetables, etc., she is not doing it with proper bhakthi bhAvam – so mAmunigaL asks her to stay away for 6 months as punishment as he wants the kainkarayaparars to be 100% staying in bhagavath/bhAgavatha nishtai. Once when one srivaishnava named “varam tharum piLLai” comes to mAmunigaL alone, he says srivaishnavas should never go to emperumAn or AchAryan alone and we should always go with other srivaishnavas. He reveals many times the cruel nature of doing bhAgavatha apachAram and always ensures srivaishnavas develop mutual respect for each other. When one bhattar (archakar) in the temple complains to mAmunigaL that his sishyas are not respecting him properly, he insists that they should always offer proper respect to him thinking that perumAL and pirAtti are present in him always. It is not sufficient to just to go and take shelter of emperumAn. it is not sufficient to just accept sambhandham of emperumAn thru shanka/chakra lAnchanam. It is not sufficient to just do thiruvArAdhanam to emperumAn. It is not sufficient to just be parathanthran (completely subservient) to ones own AchAryan. It is not sufficent to just do kainkaryams to bhAgavathas. to do the kainkaryams which are pleasing to emperumAn and what is needed at that specific time. to keep oneselves as said by periyAzhwAr “en thammai viRkavum peruvArgaLE” (we should keep ourselves so that srivaishnavas can even sell us to others). Once we delveop our bhAgavatha sEshathavam then we will easily learn all the sampradhAya arthams by the grace of emperumAn and AzhwAr/AchAryas. For a srivaishnava who is in this nishtai – there is no necessity for them to learn anything specifically/explicitly because they are already following that charama nishtai. If we try to preach anything that we are not following it will be completely useless. It is compared to be like a prostitute preaching others how to be pure in their conduct. There is no greater service than worshipping srivaishnavas and there is no greater fault than doing apachArams to srivaishnavas. Hearing these instructions that srivaishnava become very much devoted to mAmunigaL and was constantly thinking about him and worshipping him even after returning to his native place. It is easy to speak about and summarize any AchArya’s vaibhavam but mAmunigaL’s vaibhavam is unlimited. Even he himself with his thousand tongues (as AdhisEshan) cannot speak his glories, so how can we do that to our full satisfaction. We just have to satisfy ourselves saying that some how we benefited immensely by speaking (and reading) about him today. He was accepted by periya perumAL as his own AchAryan and completes the AchArya rathna hAram and the OrAN vazhi guru paramparai. periya perumAL being his sishya, offers his own sEsha paryankam to mAmunigaL which we can observe even today – except mAmunigaL no other AzhwAr/AchAryan has sEsha paryankam/pItam. periya perumAL being his AchAryan, composes a thanian, offers it to mAmunigaL and instructs that this thanian should be chanted in the beginning and ending of any aruLicheyal gOshti in any place – temples, mutts, thirumALigais, etc. In AzhwAr thirunagari, during ippasi thirumUlam (mAmunigaL’s thirunakshathram), AzhwAr, after his thirumanjanam, sends all his own pallakku, kudai, chAmaram, vAdhyam, etc to mAmunigaL’s sannidhi to bring him over. Only mAmunigaL’s arrival, he adorns the thirumaNN kAppu and gives the prasAdham to mAmunigaL. mAmunigaL is the only AchAryan from our pUrvAchAryas whose thiruvadhyayanam is celebrated. Usually thiruvadhyayanam is celebrated by sishyas and sons. In this case, sri ranganAthan is the living sishya of mAmunigaL who celebrates his AchAryan’s thIrtham in a grand manner even today. He sends his own archakas, parichArakas, paraphernelia (all his vattil, kudai, chAnaram, etc), etc for the mahOthsavam. For detailed information in this mahOthsavam please view http://www.kaarimaaran.com/thiruadhyayanam.html. mAmunigaL was so focussed on not having any glories/celebrations for himself – both in srirangam and AzhwAr thirunagari, he insisted that his archA thirumEnis should be very small and not have any purappAdu, etc., since the focus is on namperumAL and AzhwAr respectively. That is why we see him in very small and beautiful thirumEnis in both these dhivyadhEsams. mAmunigaL was so polite and humble that he would not write ill of any one. Even when there are seemingly contradictory words/meanings in pUrvAchArya vyAkyAnams – mAmunigaL will never harp on it and find fault in one side or the other. mAmunigaL focussed on aruLicheyal and explained vEdhAntham through aruLicheyal pAsurams. Without his advent it is said that thiruvAimozhi and its meanings would have become like tamarind soaked in a river i.e., it would have completely vanished. mAmunigaL collected all the available granthams and wrote them personally and preserved them so many generations later we can still get them. He had apAra kAruNyam even to the ones who troubled/insulted him, he would never show any anger. He would always respect them and treat them nicely. It is said that when we are ready to hold his thiruvadis on our head, amAnavan (the one who helps us cross virajai river) is guaranteed to hold our hand and relieve us from this samsAram. His dedication towards emperumAnAr was unparallel and he showed us how to worship emperumAnAr by practically demonstrating that himself. His life was an example for the writings of our pUrvAchaAryas on how a srivaishnava should conduct himselves. This was discussed in detail in adiyen’s ebook named srivaishnava lakshaNam. Click here to see this series of articles and ebook – http://ponnadi.blogspot.in/p/srivaishnava-lakshanam.html. Simple translation: I (sri ranganAthan) worship maNavALa mAmunigaL who is the target of thiruvAimozhi piLLai’s dhayai, who is an ocean of jnAnam, bhakthi, vairAgyam, etc and who has great attachment towards emperumAnAr. With this we have completed the OrAN vazhi AchArya paramparai. It is said that we should end everything in a sweet manner. That is why our OrAN vazhi paramparai also ends with mAmunigaL and his charithram are sweeter than anything else in both the worlds (nithya vibhUthi and leelA vibhUthi). 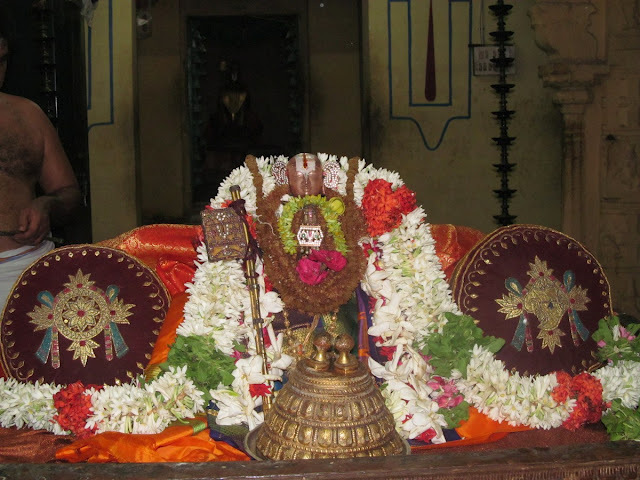 mAmunigaL’s thirunakshathra mahOthsavam is celebrated in a grand manner in many dhivyadhEsams like AzhwAr thirunagari, srirangam, kAnchipuram, srivilliputhUr, thiruvahidhrapuram, vAnamAmalai, thirunAryaNapuram, etc. We can all participate and have ourselves purified by being present infront of our AchAryan who was the beloved AchAryan of sri ranganAthan himself. We will continue to look at other great AchAryas in our sampradhAyam in the coming articles. But before going into the anubhavam of other AchAryas, we will have to understand the glories of ponnadikkAl jIyar who is the thiruvadi nilai of mAmunigaL and was considered by mAmunigAL as his life breath and well wisher. So, let us enjoy ponnadikkAl jIyar vaibhavam in the next article. This entry was posted in OrAN vazhi guru paramparai and tagged mamunigal ranganathan sri sailesa thanian periya jeeyar on September 23, 2012 by sarathyt.